A hot water button will let you pour hot water to brew some tea or make instant soups and oatmeal while the iced coffee mode will be of great use to create iced latte on a hot summer day. The Keurig K-Elite is a fully-featured high-end personal coffee maker created for true coffee addicts who want their perfect morning cup of Joe without much time and effort. Offering a fully customizable brewing experience, it will make coffee to any taste. Moreover, with a programmable on/off, the brewer will be ready when you are ready. A special Scoop™ brew basket is designed to measure your ground coffee with ease and precision. It features two measure lines for exact serving amounts. To prevent spills and splashes, you'll have to pick the right cup height. No coffee lover appreciating a distinct rich aroma of freshly brewed ground coffee will pass by the Hamilton Beach 49981. It does not need K-cups or coffee pods, giving you an unmatched opportunity to experiment with coffee grind types, flavors, and brands. The travel mug, brewing basket, and reusable filter are dishwasher safe making the unit maintenance a real snap. And to keep the exterior clean, it is enough to wipe it with a damp cloth from time to time. The travel mug is somewhat poorly insulated. 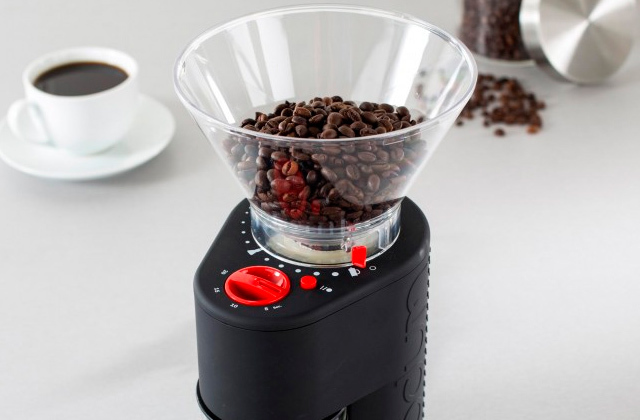 If you are really big on coffee and drink it several times a day but a full-scale coffee machine doesn't fit your small kitchen, this compact, practical and functional personal coffee maker from Balck & Decker should not go amiss. It works both with fine and medium grinds and can make 2 cups of coffee simultaneously in a matter of seconds. 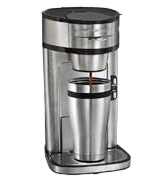 The thermal cup in this model is made of stainless steel and features double walls ensuring efficient heat retention up to 4-6 hours. 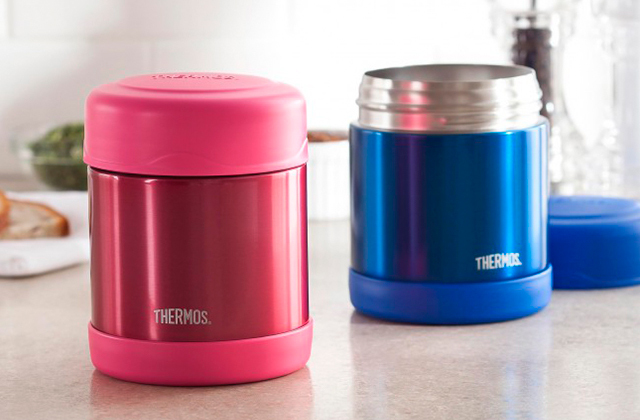 A plastic lid with a silicone seal will let you conveniently sip your hot drink even on the go. Water preheat takes pretty long. 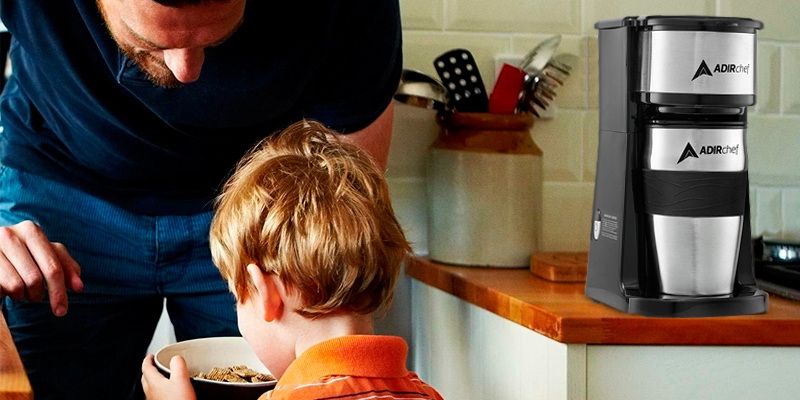 The AdirChef single serve coffee maker is a great choice for active people who are often short of time to enjoy their morning cup of coffee at home and have their caffeine fix on the go. 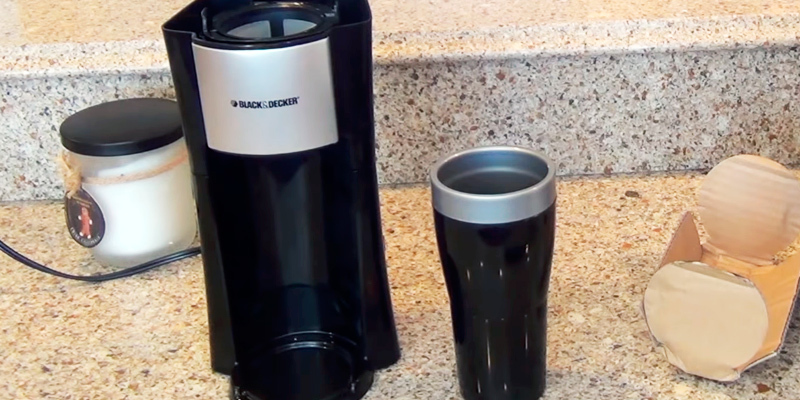 You can quickly make a large cup of freshly brewed coffee at home and take it with you in a well-insulated travel mug. Really compact brewer dimensions will help you find the place for this little fellow even in a small kitchen limited in countertop space. One-touch cleaning option greatly facilitates the unit maintenance and prevents limescale buildup. Water reservoir capacity is a bit low. Compatible with a whole variety of K-cups irrespective of the brand, the CHULUX brewer gives you a chance to taste a myriad of coffee flavors without being limited to a single brand. Besides, extremely compact size makes it a real find for coffee drinkers on the go. What makes a good cup of coffee? Basically, it’s a distinct flavor revealing a bouquet of after-tastes and a nice thick crema on the top. But, in fact, there is no single formula for a perfect cup. As they say, tastes differ, and everybody likes it brewed their way. Some like it strong and piping hot while others tend to a more delicate flavor and mild temperature. Hence, when it comes to coffee brewers, customization is presumably the most important aspect to consider. And this is where the K-Elite personal coffee maker excels. Being the leader among top-liners, the K-Elite boasts modern high-end design and premium programmable functionality. On the top of the unit, you will find a control panel with an LED display and backlit buttons. Unlike many other single serve machines providing only volume control, the K-Elite offers a fully customizable brewing experience. You are free to choose between 5 cup sizes ranging from 4 oz to 12 oz. Next, you can adjust the brewing temperature and select the brew strength. So, whether you like the bold bitter taste of ristretto or a mild chocolate flavor of Irish coffee, you’ll get your perfect brew. What’s more, you’ll get your favorite drink ready at a single touch of a button without much effort and unnecessary hassle. 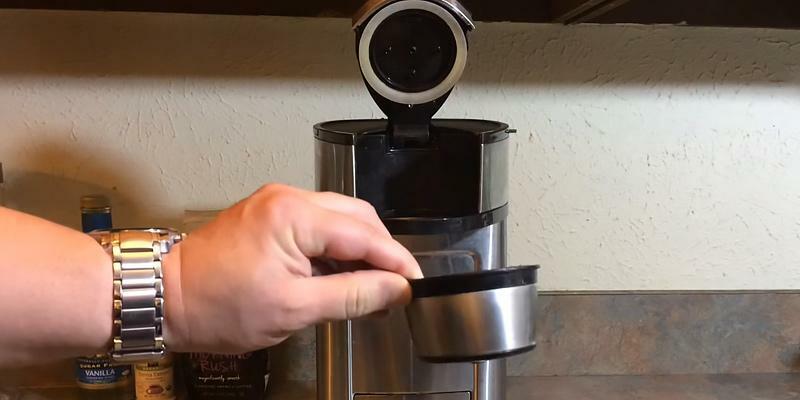 Just hold the water tank full, insert a K-cup with the taste to your liking, select the strength, and then press the cup-size button to get the desired volume. 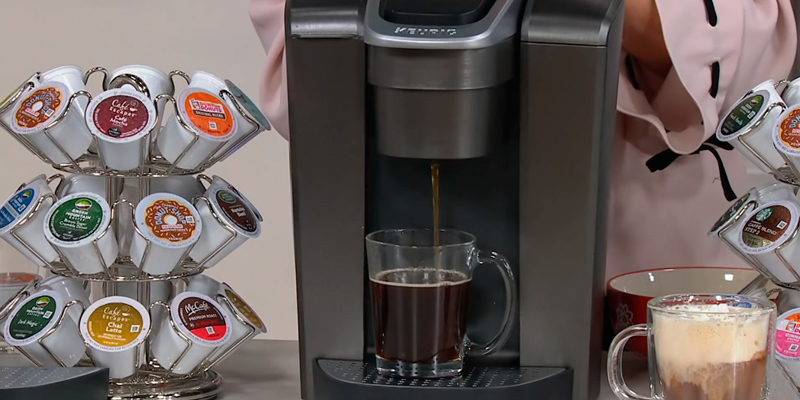 In less than a minute, you’ll get your cup steaming with an incredible aroma. With the K-Elite, you’ll be able to make much more than just hot coffee drinks. 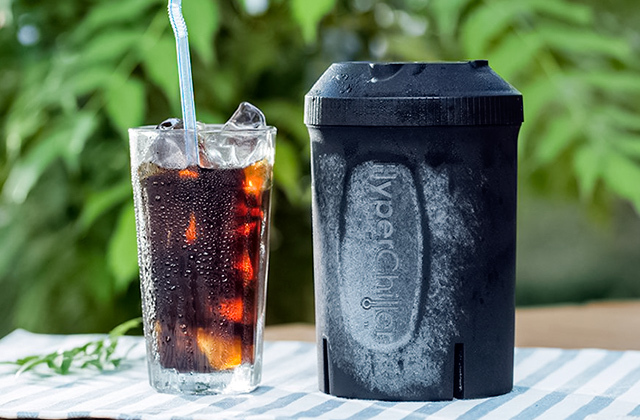 The “Iced” button will let you brew hot over ice coffee to make a chilly drink with your favorite coffee flavor to refresh yourself on a hot day. 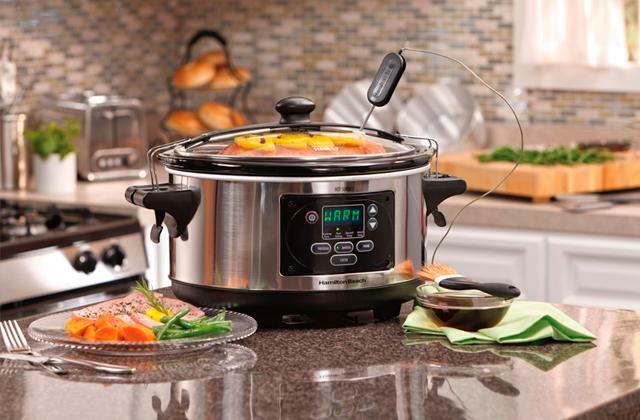 Besides, a “Hot water” button allows dispensing boiling hot water to brew a pot of tea or make instant soup, noodle, or oatmeal for breakfast or quick meal. The water tank can hold 75 oz of water and will let you make 8 cups per single fill - such capacity is more than enough even for a large family. One more distinguishing feature of the K-Elite coffee maker that you won’t find in many other models, even in its price range, is a programmable on/off function. This function will enable you to set the exact time you want your brewer to turn on and preheat in the morning. 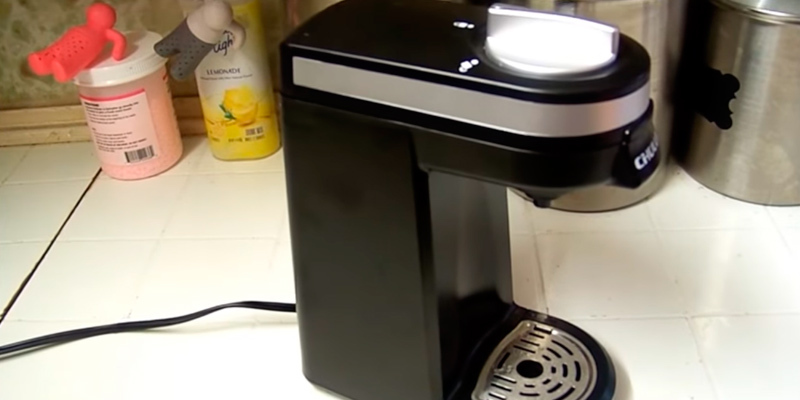 Not only does this function allows saving energy, but also you will have your coffee maker ready to brew when you are ready to have your caffeine boost. 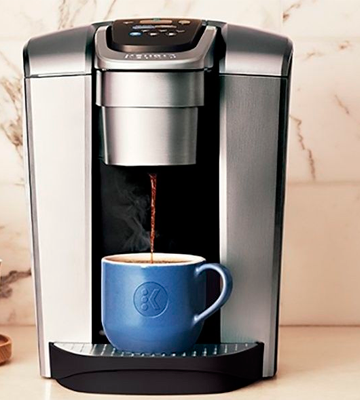 In short, the Keurig K-Elite is a fully-featured single-serve coffee maker that offers a fully customizable brewing experience to meet any taste and will be highly appreciated by true coffee addicts who want their cup of Joe quickly and without much effort. The first thing you will admire about the Hamilton Beach 49981A single-serve coffee maker is its eye-catching design of stainless steel that will perfectly blend with any kitchen interior. 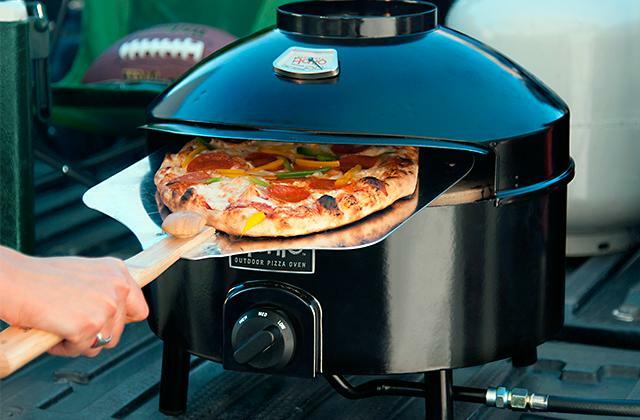 It’s worth saying that for the well-thought design and highly efficient operation, this model was awarded a “2012 Good Housekeeping Very Innovative Products (VIP) Award" from Good Housekeeping Research Institute and got high rankings from the Industrial Designers Society of America (IDSA). The model is fast, simple to handle, and compatible with most types of ground coffee. Instead of making the whole pot and wasting a good half of it, with Hamilton Beach, you can make as much coffee as you want and no more, be it a single cup or several serves. Just add your favorite ground coffee into the scoop filter, pour fresh water, and brew. You’ll be impressed how quickly it will prepare a customized cup. 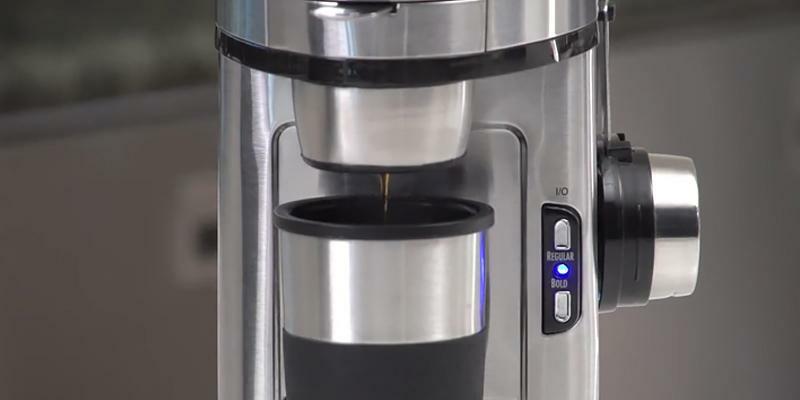 It drips an 8-oz cup in about 90 seconds and a 14-oz travel mug in less than two and a half minutes. An integrated adjustable L-shaped metal stand will easily accommodate both standard-size cups and taller mugs for splash-free dispensing. It addition, there is a drip tray that will catch the spills, if there are any, keeping your countertop dry and clean. Unlike with many other one-cup coffee brewers, in this model, you can adjust the strength not only by using more or less water but also by varying the quantity of ground coffee and choosing coarser or finer grind. On the front panel of the unit, you will find two control buttons for "Regular" and "Bold" settings. The Regular setting works best if you need a quick cup and decide to go for a standard automatic drip coffee. The Bold setting is recommended for flavored, decaf, and finely ground blends as well as for premium brands like Starbucks® and Dunkin’ Donuts®. In "Bold" mode, the water passes through coffee at a slower rate but longer brewing results in better flavor extraction. Choose “Bold” for stronger, better-tasting and more flavorful coffee. Say good-bye to k-cups and enjoy the freedom of experimenting with your favorite coffee blends, flavors, and strengths! A distinguishing feature of the Hamilton Beach 49981A is a one-of-the-kind Scoop™ Brew Basket that contributes to a hassle-free preparation. A handy scoop to measure ground coffee doubles as a filter to be placed in a holder with an additional fine-mesh filter. For exact serving amount, the scoop filter features two measuring lines. The lower line goes for 2 tablespoons of ground coffee while the top line equals three full tablespoons. However, you are free to add more or less coffee to customize your own perfect cup. However, bear in mind that overfilling the scoop can cause water to overflow and spills. After brewing, you can rinse the scoop filter and hang it to dry on a special knob on the side of your coffee maker. Ground Coffee or Coffee Pods? The Hamilton Beach 49981A is compatible not only with ground coffee but also with pre-packed soft coffee pods. It’s a truly great option when you need a quick caffeine fix and you want to save time on filter and machine cleaning after brewing. The best way to enjoy high-quality coffee with an exceptional fragrance on a daily basis is to roast and grind it yourself. Coffee roasters are designed to obtain ideally roasted coffee at home. Check our review to choose the one for yourself. Those who live in city studios or have small kitchens will think twice before buying another kitchen appliance, especially the one that will take countertop space. The same is true for rented apartments since you’ll hardly admire packing and transporting a whole lot of stuff if you move from time to time. However, for a coffee addict, starting a day without a caffeine boost is close to impossible and they would rather sacrifice a cooker to a coffee machine in the kitchen. This is where a personal coffee maker from Black and Decker will come in. What you’ll get is a fairly compact in size unit with a slim profile and small footprint that will take minimum space on your countertop and will fit the most cramped kitchens even if you think there is no place for it. All of this is thanks to a low volume capacity of the machine. There is no removable water tank you’d find in other models of this type. Instead, you’ll have a built-in water reservoir with a fill opening on the top. You can make a 16 oz coffee serve at a time that will be brewed right into a travel mug included in the package. Besides, you can use your favorite travel mug or large cup that will match by height. If you really have no free space and every inch of the countertop counts, you can conveniently store the machine in a kitchen cabinet when not in use and easily take it out every time you feel like drinking coffee. Black and Decker is a popular brand in power and garden tools that stands out for the excellent product build quality and performance. Though the CM618 is a simple kitchen appliance, the manufacturer still sticks to its high-quality standards. The unit body is all made of first-class plastic that doesn’t add weight to the unit and makes the whole machine light and portable. Meanwhile, plastic is highly durable, it’s not prone to damages and deformations and it doesn’t heat up during the unit operation. The brewing basket is also made of heat-resistant plastic and a permanent filter is made of metal and needs no replacement. Other than that, to prolong the heating element and brewing system service life and prevent overheat, the machine shuts off automatically after each brewing cycle. 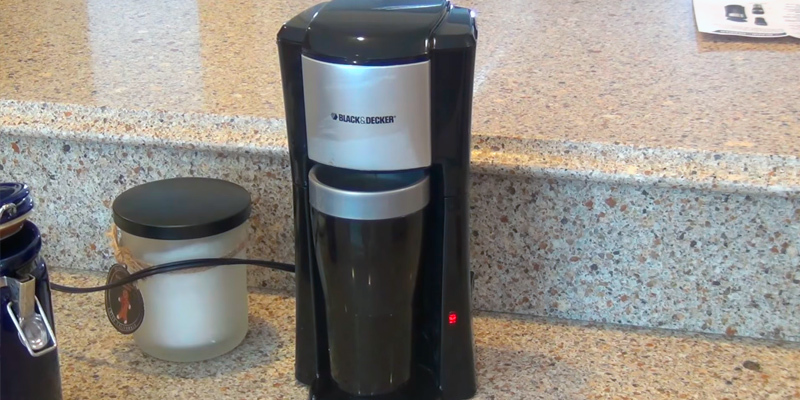 Despite its compact design, the Black and Decker is a fully functional coffee maker. The brewing process is fully automatized and you’ll be really amazed by the brewing results. At the same time, it will take minimum of your time and effort to brew a barista quality cup of coffee at home. All you need is to pour water into a reservoir, put your favorite ground coffee into the filter basket, press a single control button and let the machine do its job. In several minutes, you’ll enjoy the taste and flavor of the cup of Joe brewed at its best. To customize the coffee boldness to your liking, you can adjust the amount of ground coffee added to the basket or even go for pre-packed coffee pods of your choice. When brewing is finished, you need to clean the machine and believe us, it won’t take more than a couple of minutes. 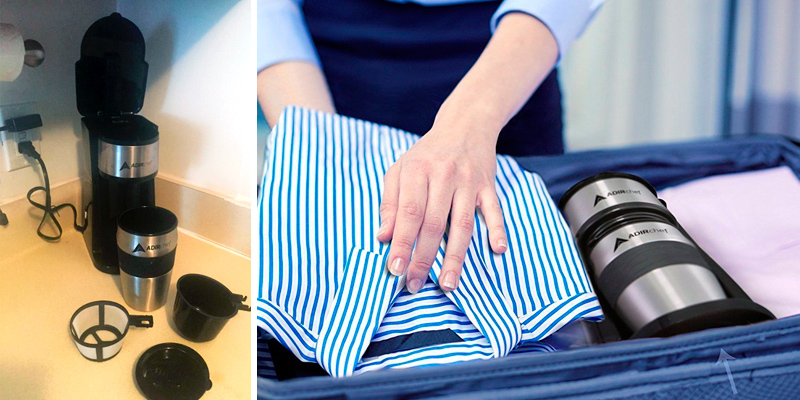 The travel mug, brewing basket, and reusable filter are dishwasher safe and the exterior can be easily wiped with a damp cloth. To cut a long story short, the Black and Decker is a practical and functional coffee maker that offers a hassle-free brewing experience and will let you continuously enjoy freshly brewed coffee, no matter how small your kitchen space is. How often do you find yourself in the morning rush drastically lacking time and choosing to take shower and brush your teeth instead of eating breakfast, not to say about a cup of flavorful coffee? Does it look like you? 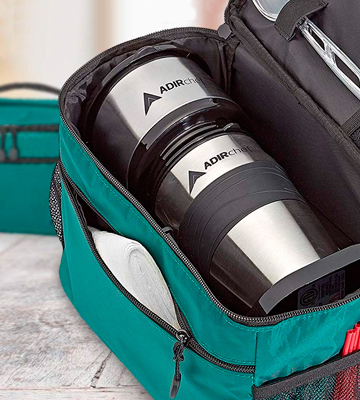 If so, you will definitely like the AdirChef single-serve coffee maker created with active lifestyler and on-the-go coffee drinker needs in mind. 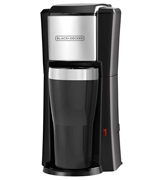 This model offers the benefits of professional brewing packed in a compact and space-saving design. Featuring fully automatic operation, it will need no specific skills from your side and actually almost no efforts. It will hardly take you more than a minute to fill the water tank, add ground coffee to the brewing basket, and press the button on the side. While you go through your morning grooming routine, the AdirChef will brew up an aromatic hot drink for you. It’s quick and easy as one, two, three. 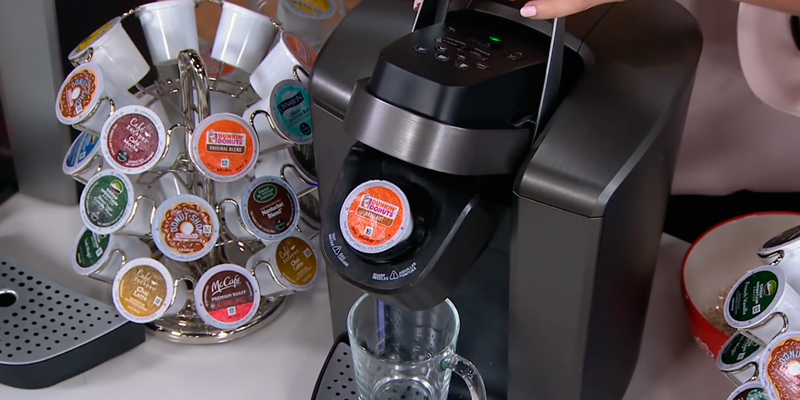 What’s more, the unit comes complete with a branded travel mug that neatly fits into the machine. Not only does it ensure splash-, spill-, and mess-free brewing but also you can easily take your coffee with you to your morning commute. And be sure you’ll enjoy the taste to the full. 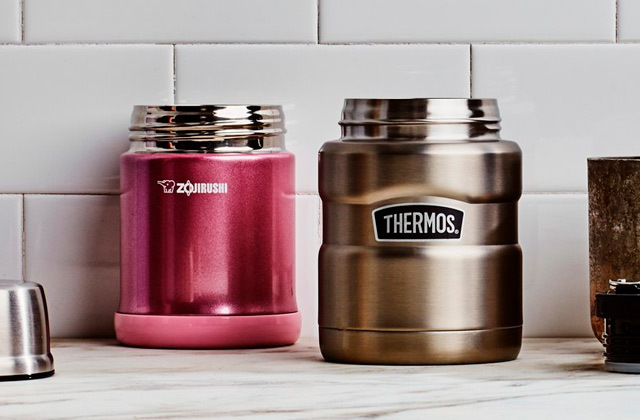 Made of stainless steel, the thermal cup features double walls to efficiently retain heat up to 4-6 hours. A plastic lid with a silicone seal will trap all coffee flavors inside and let you conveniently sip your hot drink when on the go. Other than that, a rubberized insert on the exterior provides a safe and firm grip and the cup easily fits the majority of vehicle cup holders. Though functionality and brewing performance are undoubtedly the most important features of the coffee maker, for many customers, the unit design also matters since the machine is usually intended to stand on the countertop. The AdirChef covers all those aspects. The unit comes encased in a really stylish body. 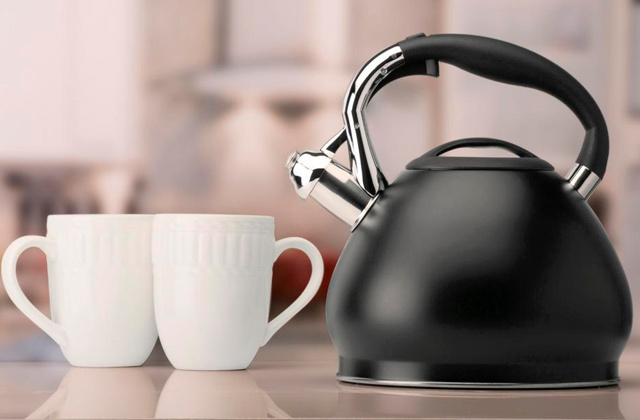 A combo of shining silver steel, black plastic, and smooth lines looks contemporary and will add a modern touch to any kitchen interior, be it moderate classics, minimalistic high-tech, practical loft or exquisite art deco. Besides, all materials are of high-quality ensuring easy maintenance and long service life of the unit. 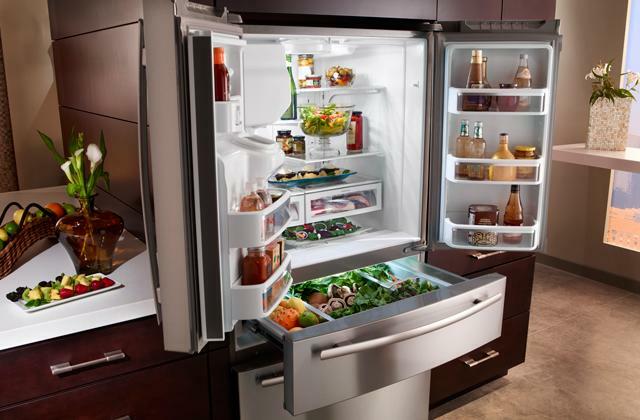 And thanks to a truly compact size, this model will fit any kitchen space. The machine performance doesn’t trail behind an appealing design as well. The water will be precisely preheated to the optimal brewing temperature to extract the maximum taste and flavor from coffee beans. You are free to choose between ground coffee or coffee pods. A fine filter mesh will keep the tiniest coffee grains inside irrespective of the coffee grind you pick, hence, you are free to experiment with flavors and mix your own coffee blends. Many personal coffee makers require the use of K-pods or paper filters, thus, increasing the amount of waste you have to discard and affecting your budget pretty much since you’ll have to buy them time and again to enjoy your coffee drinks on a daily basis. 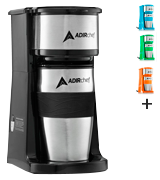 With the AdirChef coffee machine, it is different. No replaceable filters and plastic wastes. 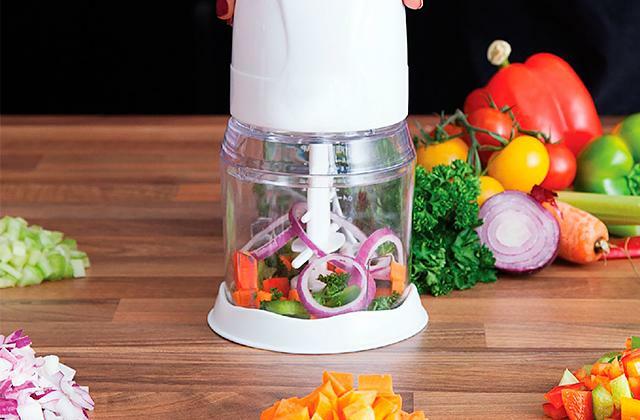 The model features a permanent filter made of plastic and metal mesh that can be easily removed and cleaned under running water or in a dishwasher after each use. Other than that, you can use coffee grounds to fertilize your home plants or make a perfect body and face scrub. 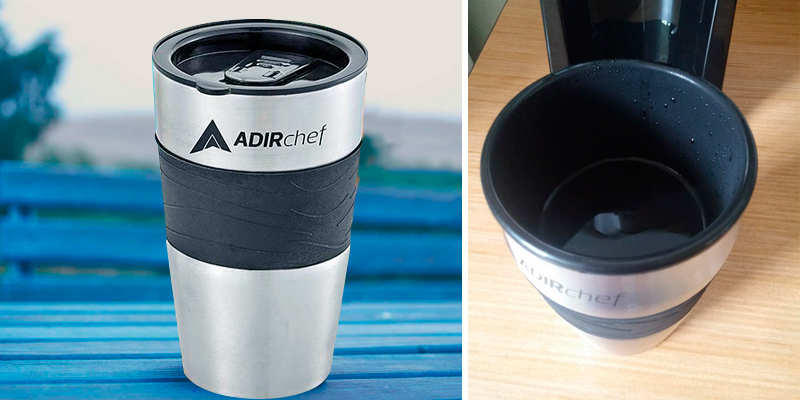 All in all, the AdirChef single-serve coffee maker with an airtight travel mug will give you a chance to drink your favorite hot coffee every morning even if you are short of time. And it will save you the need to drop into a coffee shop for a caffeine fix when rushing to work. The convenience and practicality of single cup coffee makers are hard to beat. Yet, not all pod-based machine are the same. Many of them would limit your choice of coffee to a single brand. Not only is it fairly inconvenient since some brands have a poor choice but also it might appear not that cost-effective because a certain brand might appear rather pricey. To avoid those hassles, CHULUX has designed a single-serve brewer compatible with pretty much all capsules and K-cups. 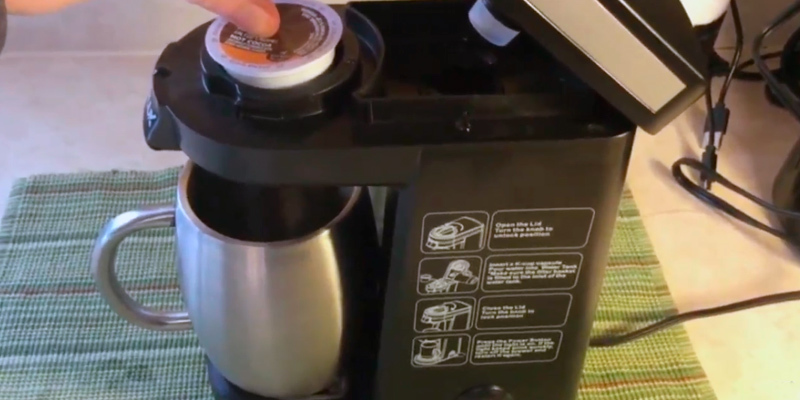 The Chulux brand is not that popular as Keurig or Breville and the machine can seem too simple at a glance but it in no way means that it lacks functionality. The unit really has a no-frills construction with less automation and without the bells and whistles of premium brands. However, the price-tag of this model will impress you as well. It costs times less than top-rated models. Let’s have a closer look what you’ll get for that money. All the basics you expect from a small pod brewer are there. You’ll still get your cup ready at a single touch of a button and will have an opportunity to adjust the volume of your drink as well as enjoy the benefit of mess-free brewing and easy maintenance. A 12 oz water tank will let you adjust the size of your drink by simply adding the necessary amount of water. There are no added controls for that. Then put the pod of your choice into a pod holder, turn the switch on the lid to fix it and press the power button. In about two minutes, you will enjoy your coffee serve. It might take some more time than for other machines, yet, in the end, you’ll get the same barista style coffee shot. Simple and functional, the Chulux individual coffee maker has specific merit that distinguishes even from premium models. It’s a compact and fairly portable design. Overall, single cup brewers are not bulky, but this unit is really small. Thanks to a low-volume water tank and the absence of a full-scale control panel, it boasts a narrow profile. Thus, this little fellow will fit even space-limited kitchens, dorm rooms, studios, small apartments, and offices. It can also be used in caravans, trailers, RVs or as an added single serve unit to a fully-featured espresso machine or coffee maker. 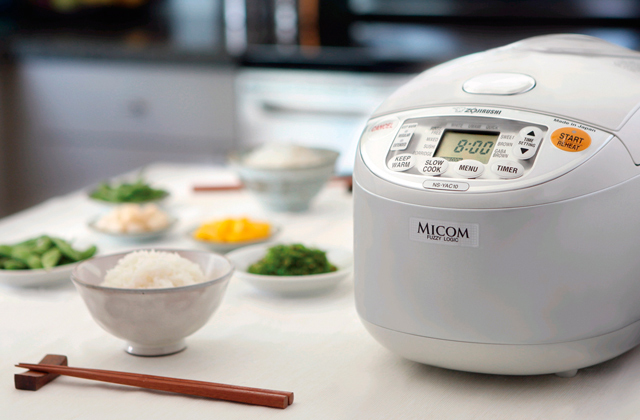 Though offered at an affordable price tag, this mini machine is a high-quality unit. It is made of BPA-free plastic durable enough to withstand damages and safe to the food. The whole construction is solidly built, it doesn’t leak and ensures mess-free brewing and pouring. The product is also FDA certified to give you total peace of mind about its quality. 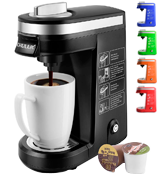 To sum up, the Chulux personal coffee maker is a great choice for small kitchens, travelers, on-the-go drinkers, and everyone who wants the freedom of tasting different coffee flavors without a hassle. 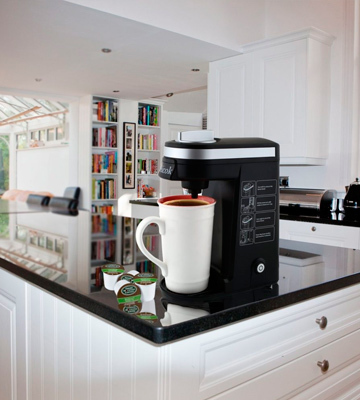 What Is a Personal Coffee Maker? Many of us can hardly imagine a morning without a cup of freshly brewed coffee. Not only does it give us a boost to make our body and mind work, it also lavishes our taste buds with a bold and rich flavor of ground coffee beans. But what to do if you usually have very little time in the mornings to make that cup of tea for yourself, let alone your spouse and other family members? A personal coffee maker machine will come to help. What distinguishes this type of a coffee machine is that, being smaller in size, it requires less time and effort to brew a cup of coffee. 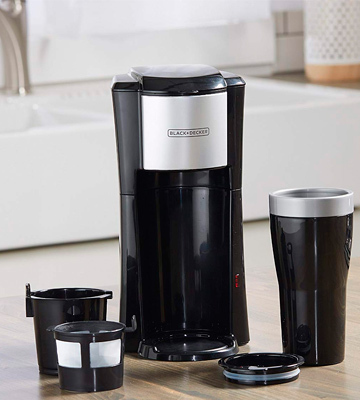 With a personal coffee maker you won't need to fiddle with multiple settings and will be able to drip coffee right into a travel mug (if you have one, of course) to take your favorite drink with you. 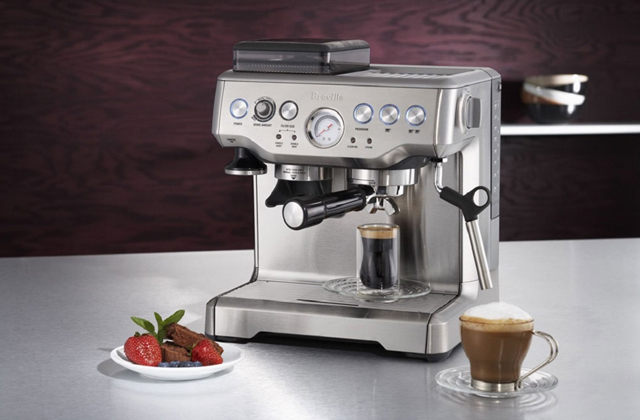 If you've not decided which coffee machine to purchase yet, we suggest you also take a look at cappuccino makers and espresso machines. 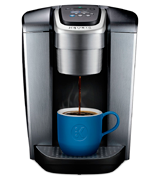 Basically, single-serve coffee machines fall into two major types that use similar operational principle. Pump brewers use a pump creating a pressure over 10 Bars to force hot water through the pre-ground coffee. As a result, you will get delicious coffee with thick golden crema highly praised by all coffee addicts and professional baristas. Drip coffee makers heat up water to the required temperature, then it gradually passes through the filter with coffee and drips into a cup or a carafe. The coffee from a drip brewer is stronger due to a higher level of caffeine. As compared to pump models, drip units are more cost effective and give you a better caffeine fix to boost yourself. 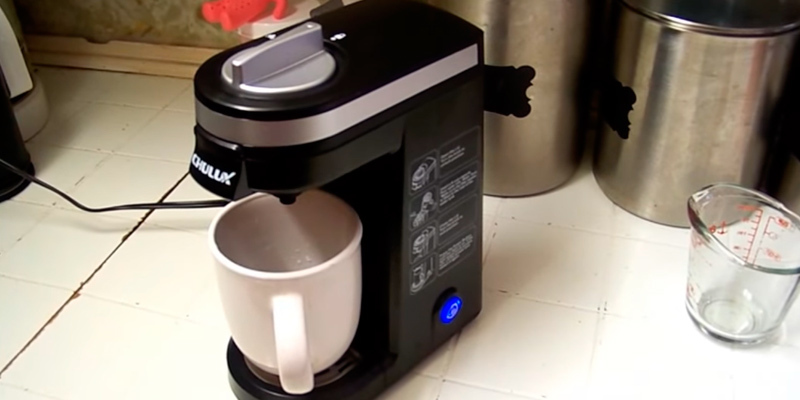 Commonly, one-cup coffee makers use ground coffee or coffee pods. Ground coffee gives you an opportunity to experiment with coffee flavors and make individual blends to your taste. Meanwhile, coffee pods are easy to use, they save you the trouble of guessing how to measure the exact amount of coffee per serve and allow diversifying your morning menu with tea, cocoa or even hot chocolate. However, some beverage pods work only with certain machines. As a rule, such coffee brewers feature lower price but your choice of coffee will be restricted by a single pod brand. Coffee machines designed to brew ground coffee require a filter, be it a single-use paper filter or a permanent one. Paper filters are easy to dispose of but they do not last long. Permanent filters are more expensive, but in the long run, they can be more budget friendly allowing you to save on buying replaceable filters. When it comes to controls, you can find simple models with a single button or several control buttons and those with an LCD touch screen that offer you an opportunity to customize all brewing settings, including coffee strength, to your liking. Where strength control is not available, you can adjust the strength by adding more or less ground coffee to the filter. Some manufacturers complement their coffee makers with extra features that add to the ease and convenience of use and beneficially distinguish their units from their counterparts. These little bonuses may include a carafe for making several serves at a time, a travel mug for a coffee on-the-go, a built-in water filter for better coffee quality, a replaceable water reservoir for no-fuss filling and a drip tray for mess-free dispensing. With that said, now, it’s up to you to select the model to cater to all your needs and requests. Q: What are the main advantages of personal coffee makers? A: The biggest advantage is that you can make one cup of coffee at a time. You only need to add water and coffee and in less than a minute you can enjoy your freshly brewed beverage. The next benefit is freshness. 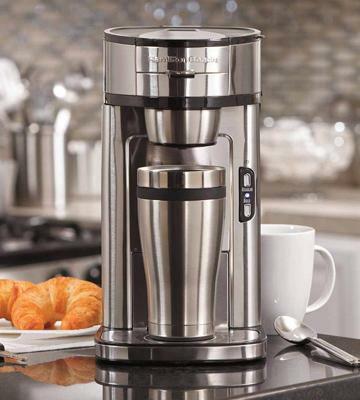 With a single cup coffee brewer, you always know that your coffee is 100% fresh. Besides, personal coffee machines are convenient to operate, easy to clean, space-saving, and cost-effective. Q: What is a pod coffee brewer? 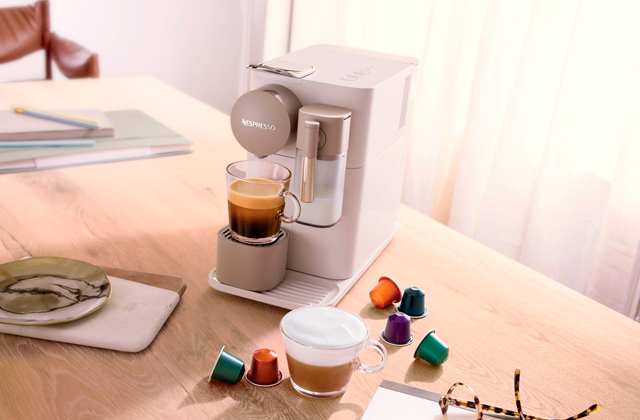 A: It’s a single-cup machine that uses pre-packed coffee pods and offers fully automatic coffee making. It’s a great option for all coffee lovers looking for a mess- and hassle-free coffee preparation. Apart from coffee pods, these machines are usually compatible with tea and hot chocolate pods offering a variety of flavors to your choice. Q: What is filter coffee? A: Filter coffee is made by hot water passing through ground coffee in a filter. It is also called drip coffee. The flavor, color, and aroma are extracted from coffee and dissolved in the water. Ideal for coffee lovers appreciating strong coffee with distinctive flavor. Many personal coffee makers use drip extraction method. Q: How do I clean my coffee brewer? A: Keep safety in mind! First of all, unplug your coffee maker and let it cool. Remove a filter basket and permanent filter (if available) and clean them in a solution of warm water and liquid soap. Avoid using abrasive cleansers, never immerse the machine itself in water, and always flip through the instruction manual for dishwasher safe parts or some specific details on cleaning. Q: What can cause a bad coffee taste? A: There are several reasons for coffee taste changes. The prime reason is old coffee that might taste stale. The fresher your coffee is the better it tastes. Two more reasons affecting your java taste are water and coffee quality. Always used fresh filtered water and opt for high-quality coffee varieties and blends. 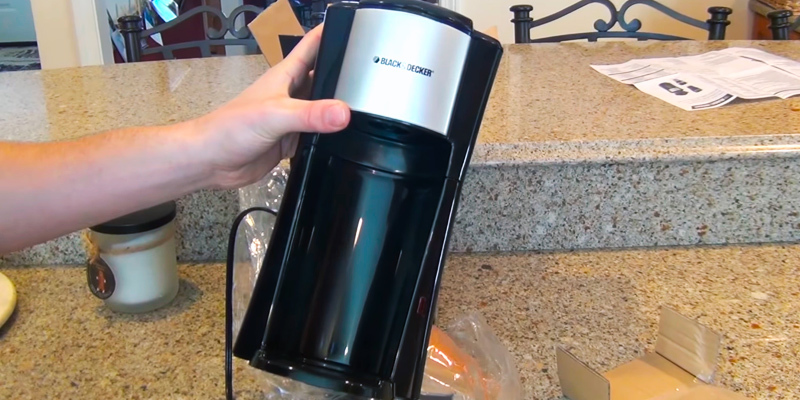 Finally, don’t forget to clean your coffee maker. 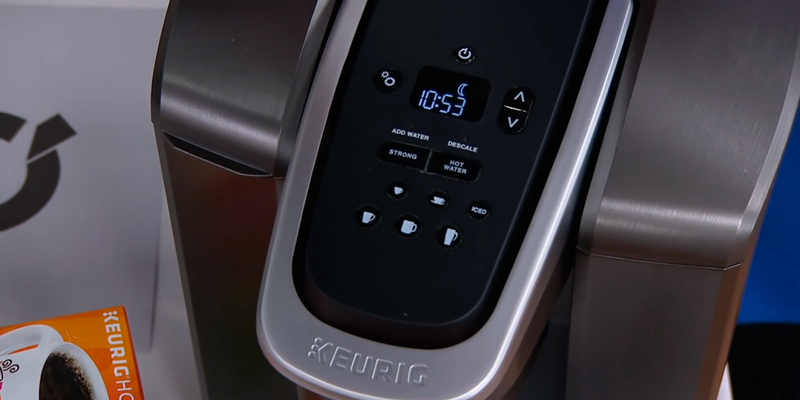 Q: How often is it necessary to clean an automatic coffee maker? A: Since cleaning prolongs the unit service life, allows avoiding bad coffee taste, and solves some brewing problems, you’d better clean your coffee machine every 40 to 80 brews. Q: Why does my coffee maker brew slower than usually? A: Coffee makers get clogged with mineral deposits over time. Hence, your unit might require cleaning to remove all sediments and scale. 1. Coffeemaker, Wikipedia. March 19, 2017. 2. Marshall brain and Jessika Toothman How Coffee Makers Work, HowStuffWorks. 3. 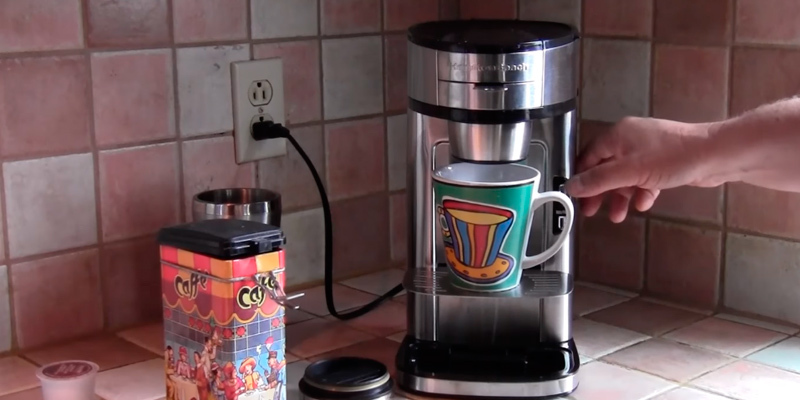 How to Use a Coffee Maker, wikiHow. 4. Tips for Becoming a Coffee Grinding Expert, Mr. Coffee®. May 20, 2015. 5. 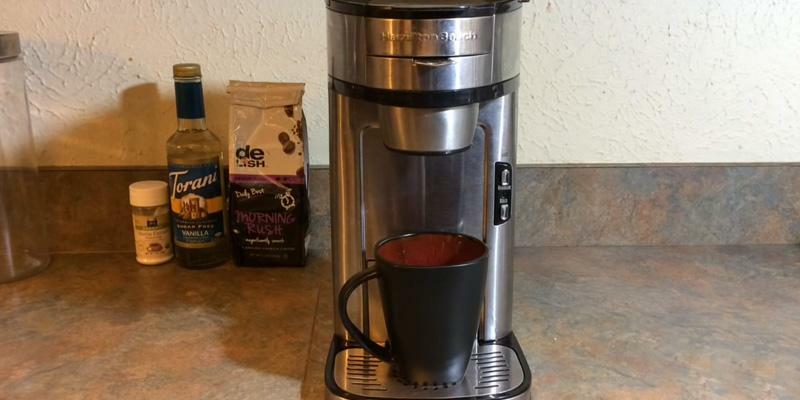 Kelvin Titus, Discover the Many Advantages of Drip Coffee Makers, Lifehack. 6. Mariah Evans 5 Great Advantages of Owning a Single Cup Coffee Maker, SelfGrowth. 7. Definitive Guide to Single Serve Coffee Makers, Home Stratosphere. 8. Create Your Own Coffee Blend, VisiHow. 9. Jessie Price 9 Rules for How to Make a Perfect Cup of Coffee, Eating Well.